The Florida Department of Education is accusing you of cheating on a teaching certification exam. What should you do? Read on for advice from a attorney for teachers. Can you cheat on the FTCE? The testing environment that gives all of the FTCE is equipped to stop cheating. They use audio and video recording along with other procedures to try and stop people from cheating. If it is hard to cheat on the Florida certification exams, how come I have been accused of cheating? If you take the test enough times, you are bound to come across the same question more than once. If you walk out of the test room and write down questions to study from later or tell a friend, it is considered cheating. The Florida DOE has clearly written test instructions that the test taker cannot not prewrite essays. That means even if you took an exam and did not pass, but practice the essay question to study, you are breaking a testing rule. Using online forums that list essay prompts and then prewriting can get you in trouble. 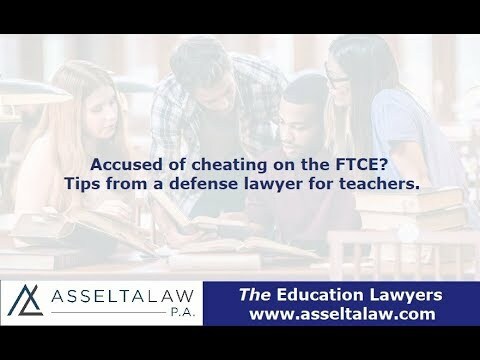 If the Florida DOE suspects that you cheated on a FTCE, they can invalidate your score and stop you from taking the test for period of time, which essentially suspends you from becoming a teacher. Can I fight the FTCE exam cheating accusation? Yes. There is an investigative and hearing process for people testing to be a certified teacher. I always recommend hiring a lawyer who handles Florida teacher professional misconduct to assist. Your career is on the line. How long does it take to prove that I did not cheat on the FTCE? That depends. Many factors contribute to how fast the Florida FLDOE processes a certification investigation. Can you help me fight an accusation of cheating on the FTCE? Yes. I help all Florida teachers facing certification issues, including appeals and disciplinary action. Call me today for a free consultation and protect your professional future. Richard Asselta is an award-winning lawyer who defends teachers throughout the state of Florida. Click here to read how he helps teachers with teaching certification discipline at the district and state levels, administrative FLDOE hearings, investigations, and denial appeals.